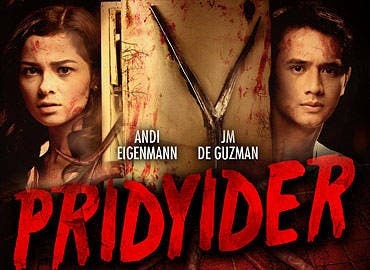 A promising young man JM de Guzman steps in to help Andi Eigenmann in a story of the horrific and terrifying events from the past that have caught up with her present, as they star in “Pridyider”, which airs on Cinema One on Sunday (August 25). “Pridyider” tells the story of Tina (Andi Eigenmann), a girl who is sent to the U.S. to live with her aunt because something happened to her parents—an incident that has never been explained to her. Hoping for a new start, she returns to her homeland and back into her family’s old house. There, she finds a companion in a young man named James (JM de Guzman), her childhood friend. Days pass and Tina begins to notice strange occurrences, particularly in the kitchen. There, an antique refrigerator stands. Tina soon discovers that the appliance is haunted, dangerous, and hungry for human blood. When all efforts to remove the refrigerator fail, she is forced to dig into her own forgotten past to find a way to rid her household of all its evils. Along with Andi Eigenmann and JM de Guzman, “Pridyider” also stars Janice de Belen, Joel Torre, Venus Raj and Baron Geisler. Catch the creepy “Pridyider” as it airs on Sunday (August 25) at 8:00 p.m. on the Blockbuster Sundays movie block of the country’s number one cable channel, Cinema One (SkyCable channel 56). For updates about the program schedule, follow @cinema_one on Twitter and like its official Facebook page www.facebook.com/Cinema1channel.